Then you will see the rise of the double standard – the men who live by force, yet count on those who live by trade to create the value of their looted money – the men who are the hitchhikers of virtue. In a moral society, these are the criminals, and the statutes are written to protect you against them. But when a society establishes criminals-by-right and looters-by-law – men who use force to seize the wealth of disarmed victims – then money becomes its creators' avenger. Such looters believe it safe to rob defenseless men, once they've passed a law to disarm them. But their loot becomes the magnet for other looters, who get it from them as they got it. Then the race goes, not to the ablest at production, but to those most ruthless at brutality. When force is the standard, the murderer wins over the pickpocket. And then that society vanishes, in a spread of ruins and slaughter. The Prolix Patriot does not advocate for a return to the gold standard, as this would be disastrously impractical even in the best case. At the same time, it is fast becoming obvious that our trust in the "full faith and credit" of the U.S. government as the basic measure of value is sorely misplaced. Even if default is avoided this time around, what's to stop future politicians from further corrupting of our entire economic system? More importantly, insurance companies, mortgage lenders, and retirement funds should not be punished because of the profligacy of our government. The last case is especially wicked. In exchange for a lifetime of honest work, millions of retirees and those nearing retirement are left with nothing except faith in the word of a politician. It is written in scripture that, "No man can serve two masters: for either he will hate the one, and love the other; or else he will hold to the one, and despise the other. Ye cannot serve God and mammon." 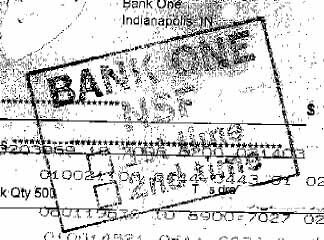 Alas, our elected officials thirst only for power and don't even serve mammon, and the motto "In God We Trust" stamped on our currency has become a twisted joke. After last night’s speech, one gets a sense that President Obama is desperate to prove to a skeptical public that he is in charge. However, the President fails to understand is that leadership is about more than just giving commands. Leadership requires respect, wisdom, patience, and above all, humility, but Obama never had to learn these hard-earned virtues prior to his inauguration. As Benjamin Franklin once said, "Experience keeps a dear school, but fools will learn in no other." All either lost re-election, or in the case of Harding, died in office. When given a choice, the people clearly decided that they didn't like the results of the first term enough to give these presidents a second chance. Given Obama’s falling poll numbers and unpopular policies, he will have a long and difficult re-election campaign ahead if he is to avoid a similar fate. Many presidents failed to win re-election despite their experience in the military or the governor’s mansion. Recent one-term presidents like Ford, Carter, and George H.W. Bush all served with distinction in the military. Other one-termers like John Tyler, Andrew Johnson, and Rutherford B. Hayes were all governors. And then of course there is the oddity of Grover Cleveland, who was the only president to lose re-election, but then later come back to win a second non-consecutive term. It is clear that previous executive experience--even in the presidency itself--does not guarantee re-election. Sometimes events are too powerful for even otherwise great and accomplished men to overcome. Patience and humility are essential virtues when confronted with the unexpected and the uncontrollable. Wise presidents know the limits of the office--and the limits of human nature. Obama doesn’t have any of these advantages. History shows that lack of experience almost guarantees an unsuccessful presidency. This is even worse for Obama, who is powerless in the face of continuing economic uncertainty. As Vice President Biden once said--as he so often does--in an unguarded moment of unintentional honesty, "The presidency is not something that lends itself to on-the-job training." Almost a year ago in these pages, the Prolix Patriot dubbed the President’s flawed economic policies a new era of “Hoover-Carterism.” Little has changed since then. In the debate over increasing taxes vs. cutting spending, Obama has led the liberal chorus of Cassandras who warn that cuts to spending will harm the economy far worse than increasing taxes, but there is scant evidence to support their claims. Rather, the only real support for Obama’s dubious policies is his own hubris. Prior to 20th century, government spending was an infinitesimal fraction of anything comparable to today. Even when the government was not the behemoth that it is now, the economy grew far more quickly than it has in recent years. Then, on February 3, 1913, the state of Delaware--which ironically has no income tax of its own--provided the 36th vote for ratification of the 16th Amendment to the Constitution which created the federal income tax. With increased taxation, the federal government also began spending more money. The effects are striking. 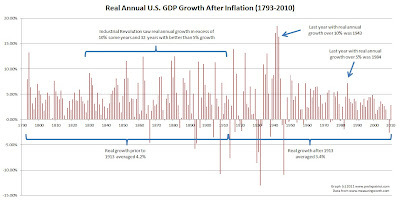 Using data from economists at Saint John’s University and Miami University summarized in the chart above, we see that prior to 1913, real growth rates (after accounting for inflation) averaged roughly 4.2% per year. Meanwhile, the economy only contracted in nine out of more than 100 years. 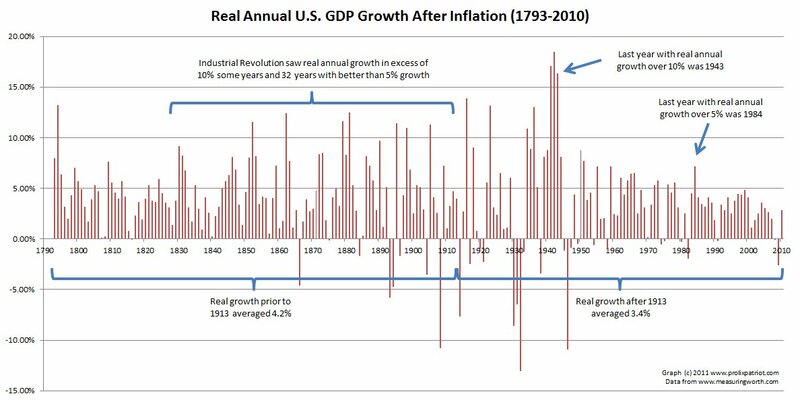 At the same time, there were 43 out of 100 years with better than 5% real growth. After 1913, real growth rates have only averaged 3.4% per year—almost a full percent less each year than pre-income tax levels. At the same time, the number of years with contractions increased from 9 to 22 out of slightly less than a hundred, while the number of years with better than 5% real growth shrank from 43 to only 29. Worse still, after the creation of the modern welfare state in response to the Great Depression, each passing decade has seen declining growth rates. The last year with real GDP growth above 5% was 1984. Some will argue that it’s not fair to compare growth rates during the 19th and 20th centuries due to technological and societal changes. However, the agricultural innovations and the invention of the microchip of the late 20th century are no less revolutionary--and probably more so--than the invention of the steam engine which launched the 19th century industrial revolution. If anything, growth today from the agricultural and information revolutions should exceed that of the 1800’s. Instead, we live in a time of economic atrophy. It’s clear from this exercise that as government taxation and spending have increased as a proportion of economic output, the growth of the economy over time has slowed until today, where it is at a virtual standstill. Despite living in an era of unprecedented technological advancement, the economy is so overburdened with taxation, government spending, and debt, that a year with 5% real GDP growth is now rare. Obama and his liberal allies claim that more taxation and spending will save us from our current plight, but even a cursory look at history shows just how absurd this Keynesian prescription really is. The hard truth is that the government really has no power to help the economy. Despite the best efforts of tinkering technocrats, the economic growth of the last 60 years has been pathetic compared to historical averages. Rather, the lesson of history shows that the government can do very little help the economy, but is quite capable of doing harm. How Big Is $1.5 Trillion? 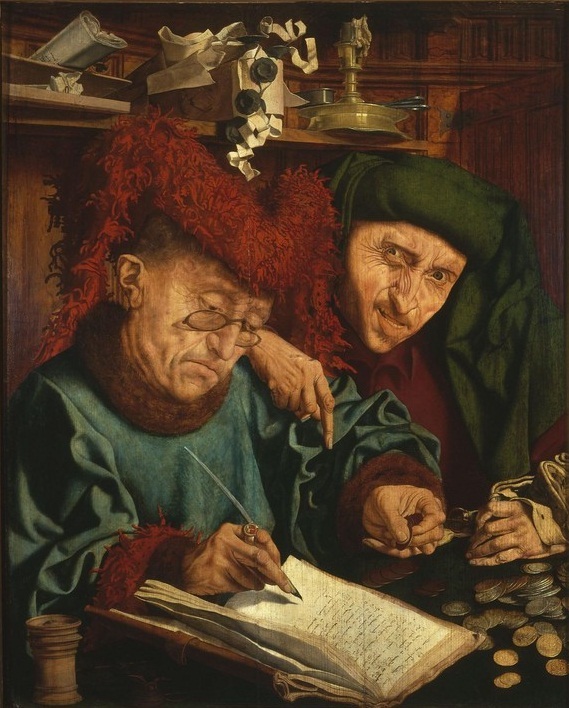 Marinus van Reymerswaele, "Two Tax Collectors"
With talks on raising the debt limit grinding along in Washington, D.C., it's worth considering just how big the problem really is. President Obama and the Democrats have been pushing tax increases as a solution to the nation's budget woes, but don't think for a moment that such increases will only affect the super rich. When the tax man comes around, we're all going to pay the price for the government's profligacy. Consider this when evaluating President Obama's claim that we can solve the nation's fiscal problems if we simply close some tax loopholes for "millionaires." Unless we make major cuts to spending--including entitlements--the scale of the problem is so immense that we are all going to have to bear some of the burden. During the 2008 election, vice-presidential candidate Sarah Palin was pilloried by the media for her initial support of the $400 million “bridge to nowhere” that would have been funded with federal taxpayer dollars. However, this is nothing compared to the vastness of the mounting debt crisis. A few hundred million dollars is laughable compared to a national debt that is measured in tens or even hundreds of trillions. While discussing the national debt limit with a friend, he compared the looming debt limit to a car that is low on gas. He argued that just as you would not slam on the brakes when you realize that you need to stop for gas in 20 miles, politicians should not treat the debt limit as a crisis. This is a useful metaphor, and perhaps it has some validity, but even if the debt limit is raised, our nation will still be in dire straits. Yes, the car of state, as it were, is low on gas. However, this is a better analogy for the problems of the private sector economy. Businesses in this country are burdened by a combination of too much uncertainty in all the wrong places plus plenty of bad certainty about over-regulation and excessive taxation. As a result, the economy is sputtering and we are on the verge of an even deeper double-dip recession. However, the car of state is also being pushed by the government towards a bridge that has not yet been fully built. As in the climactic scene from “Back to the Future III,” we have already passed the point of no return, but unlike the movie, there is no such thing as time travel. The debt problem is not going to go away by itself. Instead of gliding gracefully across a bridge to the future, we are racing towards a bridge to nowhere. As of today, the official national debt is hovering around $14.3 trillion, or about 98% of gross domestic product. Meanwhile, the balance sheet for Social Security, Medicare, and Medicaid contains about $115 trillion in red ink, or roughly eight times the current gross domestic product. Even if the government confiscated 100% of all income, assets, and property from every man, woman, and child in the nation, we still wouldn’t have enough to cover our current obligations. As the deadline for a deal to raise the debt limit nears, the Obama Administration is asking Republicans to balance cuts in spending with tax increases, but increasing the debt limit and cutting spending will accomplish nothing unless politicians have the courage to reform the choking burden of entitlement spending. 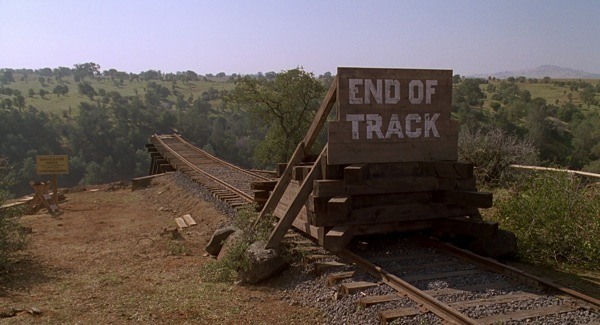 Unlike the movie, it doesn’t make any difference if we go over the economic cliff at the magic Hollywood time-travel speed of 88 miles per hour or 5 miles per hour--the end result will be the same. If we are to avoid national bankruptcy, we don’t just need to slam on the brakes; we need to throw the engine into reverse. Current proposals call for cutting between $2 and $4 trillion from spending over the next decade, but unless politicians can add a few zeroes to those figures, we are only delaying the inevitable catastrophe. In honor of Independence Day, the Prolix Patriot and the Missus watched two movies over the weekend listed under the “patriotic” section on the DVR: “Flags of Our Fathers” and “1776.” At first glance, the dark and ugly cynical realism of the former and the lighthearted Technicolor ebullience of the latter would seem to have little in common, but on a deeper level, the two films both explore the very essence of what it means to be an American. A repeated theme in “Flags” is that the world-famous picture wasn’t actually the first flag-raising. The six men immortalized in bronze on a hill overlooking Washington, D.C. were actually the second group of U.S. Marines to raise a flag at the summit of Suribachi. Similarly, in “1776,” we learn that the vote for independence we celebrate on the fourth was actually achieved on the second. The fourth was simply the day that the Declaration of Independence was made public. In addition to the temporal confusion surrounding both events that persists to this day, both movies are at pains to remind us that the men who took part in these famous events were ordinary people. A common motif in “Flags” is the facelessness of the Marines fighting at Iwo Jima. The photo of the second flag-raising was especially poignant--and popular--because those men could have been anybody’s son, anybody’s father, or anybody’s brother. Similarly, men like Roger Sherman of Connecticut, Judge James Wilson of Pennsylvania, Dr. Lyman Hall of Georgia, and Governor Stephen Hopkins of Rhode Island are largely forgotten today despite their impressive accomplishments. Aside from the mostly erroneous dramatizations of these lesser-known figures in “1776,” even the more famous founding fathers were ordinary men with ordinary desires. Thomas Jefferson had an obsession with macaroni and George Washington had a sweet tooth for ice cream--he probably even got brain-freeze from time to time. Finally, we must remember that the events depicted in both films were only the beginning of the fighting. Just as the flag-raising on Suribachi took place on the fourth day of a battle that would continue for another full month before the island was finally secured on March 26, 1945, so too the Declaration of Independence would not be recognized by Britain until the victory at Yorktown in 1781 and the eventual Treaty of Paris in 1783 which in turn was not ratified until January 14, 1784. Besides, what would posterity think we were? Demi-gods? We're men, no more no less, trying to get a nation started against greater odds than a more generous God would have allowed. First things first, John. Independence; America. If we don't secure that, what difference will the rest make? Even though Franklin probably never uttered those exact words, the movie correctly summarize the founders belief that the future of this new thing called the “United States of America” would depend on the care and judgment of future generations. The founders gave us independence and the Constitution, but they left the rest to us. The sacrifices of those who fought and died on Iwo Jima and in every battle before and since make clear that the fight for freedom is one that never ends. All of us have a duty to never stop fighting for those self-evident rights of freedom of speech, freedom of religion, and freedom from persecution and tyranny which were endowed to us by our creator. It is easy to feel patriotic on the Fourth of July. What matters though is what we do on the other 364 days of the year.